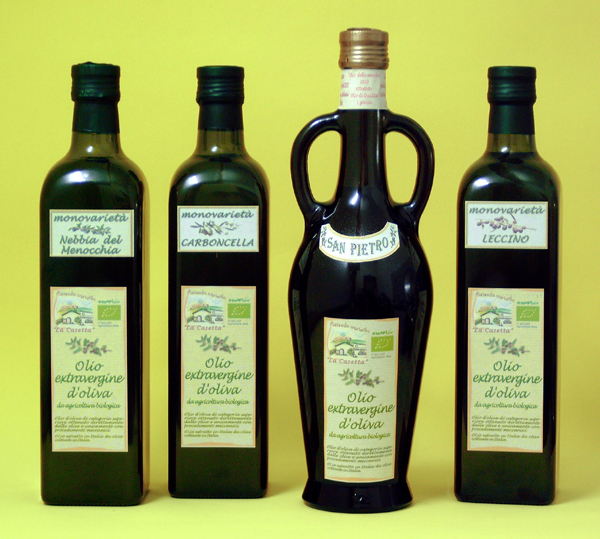 Italian organic extra virgin olive oil for sale and to buy from Italy. 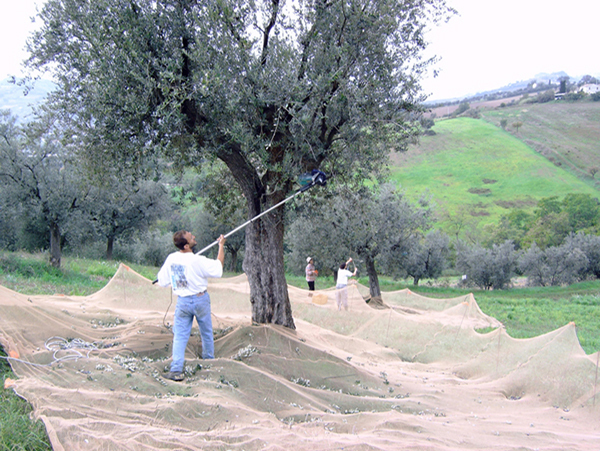 3 - an organic fight against olive fly with constant monitoring (weekly) of the population to avoid damage to the olives with consequent loss of quality. 5 - a milling, performed within 12 hours after collection, gives the oil a very low values of acidity and obtain the best characteristics. The mill used is a continuous type to ensure the absence of residues of previous processing and obtain good qualitative results. 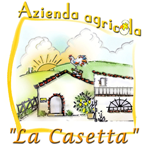 All of this makes extra virgin olive oil "La Casetta" a 100% healthy food. This oil is able to satisfy the most demanding, because it reflects fully the typical taste of the Marche oil that is with genuine aroma and character. The excellent chemical and organoleptic characteristics are tested by approved testing: Analysis performed on novembre 8, 2012 oil production 2012: acidity 0,15. Test is HERE. It comes from a special blend carefully calibrated. The native olive varieties are collected at veraison to create a fruity oil of medium intensity, green, with hints of almond, artichoke and apple. It is well balanced in the medium intense feelings of bitterness and pungency. It is recommended for seasonings in which you need an enforcement action on dishes like pasta with vegetables or toasted bread. 100% mad in Italy. 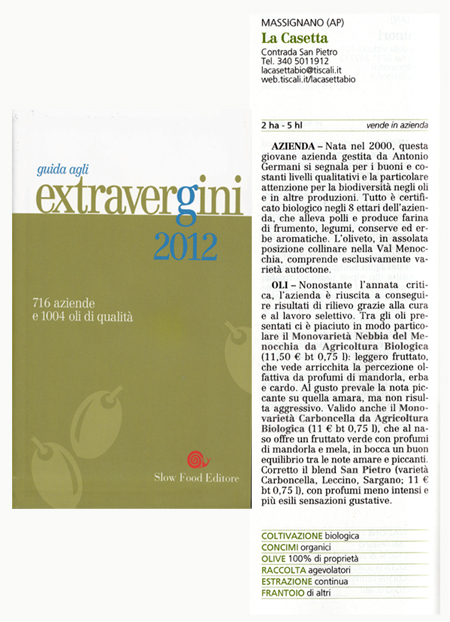 HONORED to "The gold of Marche 2008" with Quality Mention: 16.5 rating / 20. SELECTED Guide to Extra Slow Food in 2009 and 2010. 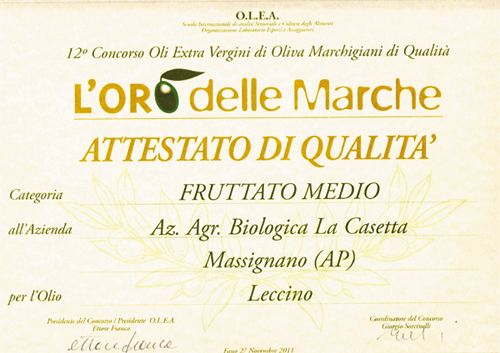 HONORED to "The gold of Marche 2010" with 1 drop and Certificate of Quality. SELECTED to Guide of Extra virgin Slow Food in 2011. Assigned 2 olives. HONORED to "The gold of Marche 2011" with quality oil certificate. SELECTED to Guide of Extra virgin Slow Food 2012. AWARD WINNING 2013: The third best Marche oil at "The gold of Marche 2012"
AWARD WINNING 2013: The tenth best Italian oil at "The gold of Italy 2013"
INTERNATIONAL AWARD WINNING 2013: the 7th best two seas oil at "The gold of the two seas"
from only one variety of Nebbia del Menocchia, harvested at early veraison, you get an oil medium intense fruity, green, with hints of almond and artichoke. On the palate it has feelings with lingering bitter and average spicy. Aftertaste of thistle. Recommended for demanding dishes such as red meat grilled or roasted bluefish. 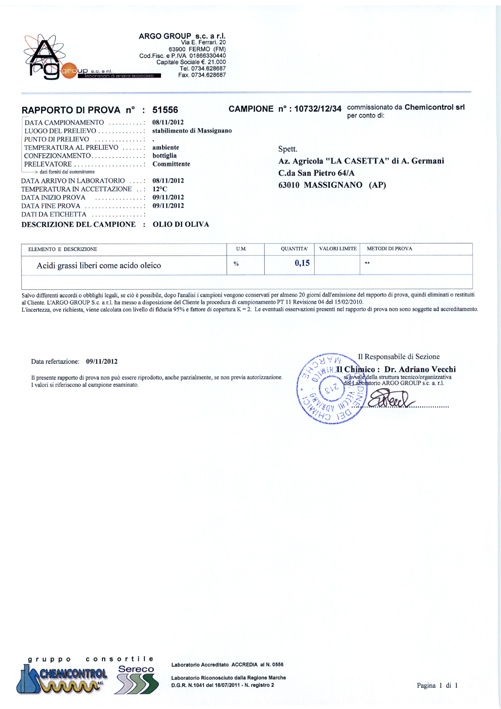 100% made in Italy HONORED to "The gold of Marche 2010" with 1 drop and Certificate of Quality. SELECTED Guide to Extra virgin Slow Food in 2011. SELECTED in the guide to Extra virgin Slow Food 2012. SELECTED in the guide to Extra virgin Slow Food 2012. From single variety olive of Carboncella veraison collected you get a fruity oil of medium intensity, green, with hints of almond and tomato. It has balanced flavor with notes of bitter and spicy. Recommended for delicate dishes like fish. 100% made in Italy. SELECTED Guide to Extra virgin Slow Food in 2011. SELECTED in the guide to Extra virgin Slow Food 2012. It is a mix of olive oils of native varieties harvested at good veraison that creates a fruity oil of medium intensity, green, with hints of almond. It is fairly balanced in the medium feelings of bitterness and pungency. 100% made in Italy.